One of the best “growth hacking” books I’ve read. Tags: Growth hacking, marketing, entrepreneurship, startups, productivity, hustle. You’re stalled out in your business or career, and you’re not sure what to do. You want to take your marketing to the next level. You know you were born for something bigger than what you’re doing, but where to start? You work too hard for what you’re producing. You know there must be a better way. “Smartcuts.” Oh yeah, that’s clever, isn’t it? I wasn’t sure about the title either, but the book starts off with an intriguing story about a college student breaking the world’s record for defeating Super Mario Bros., and just gets better from there. But seriously, Smartcuts: How Hackers, Innovators, and Icons Accelerate Success, is one of those books you feel you have to read more than once. The author is an experience entrepreneur who has figured out how to work smarter, not just harder (what Snow calls “lateral thinking”), and while the book could have gone the route of sharing a bunch of case studies you read and then think “Yeah, that’s all well and good for someone with a few million bucks to burn and a marketing department that has nothing else to do, but what about me?” the tips are practical and attainable for anyone, whether a first-time entrepreneur or gray haired CMO. It’s about how normal people did extraordinary things. One of my favorite parts tells the story of how Jimmy Fallon made it onto SNL. He worked hard, but more than that, he was smart about it. He hustled and made it happen–it didn’t just get dropped in his lap. After reading this, I have to think he must not have been that into Nicole Kidman, or he would have made that happen as well. 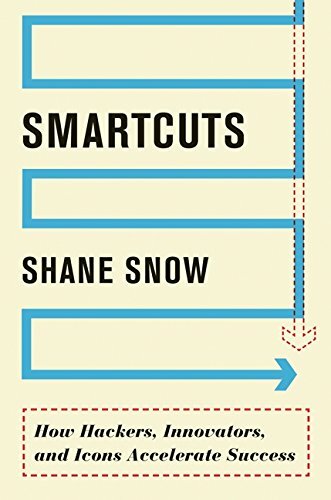 One of the great things about Smartcuts is that where many other marketing books these days tend to be derivative, sharing the same stories you’ve heard elsewhere, everything in this book was new to me, even though I’m familiar with many of the people Snow talks about.